PRIVATE INVESTOR interest in gold has collapsed in 2018, writes Adrian Ash at BullionVault. Poor performance is another, at least against the straw man of gold's 'safe haven' appeal. Bullion prices have failed to surge in 2018 despite the jump in oil prices, the US-North Korea nuclear rumblings, Italy's new comedy coalition, slaughter across the Middle East, Britain's Brexit buffoonery, blah blah blah. Judged on longer time frames however, the metal does show a 'safe haven' function, and increasingly so when stockmarket losses get worse. Since 1973, gold has risen from 12 months earlier in 55% of those weeks when the S&P was higher, but it rose 68% of the time when the US stockmarket had fallen from one year before. This pattern is clearer still for 5-year periods. Gold rose 59% of the time when the S&P gained but it rose fully 98% of the time when the stockmarket had dropped from a half-decade before. 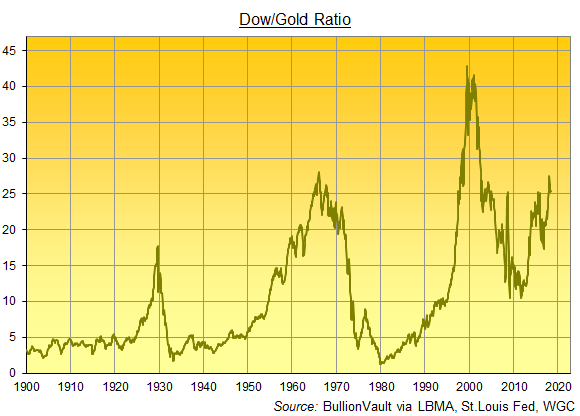 If you think the odds of the stockmarket halving from here are zero, you probably want to own zero gold. That seems the view which a growing number of private investors who already bought gold are taking for the UK Spring and US Memorial Day weekends. Whether these gold sellers are too late to join the bull run in stocks or not, only time will tell.